EAEVE: cosa richiede? La visita EAEVE: - il SER 1 - i punti critici (…per Bologna!) 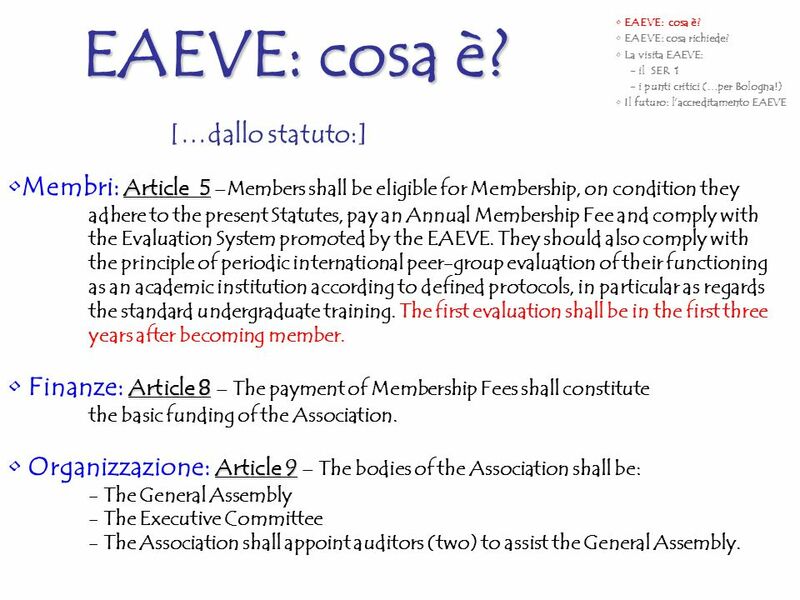 Il futuro: l’accreditamento EAEVE […dallo statuto:] Membri: Article 5 –Members shall be eligible for Membership, on condition they adhere to the present Statutes, pay an Annual Membership Fee and comply with the Evaluation System promoted by the EAEVE. They should also comply with the principle of periodic international peer-group evaluation of their functioning as an academic institution according to defined protocols, in particular as regards the standard undergraduate training. The first evaluation shall be in the first three years after becoming member. Finanze: Article 8 – The payment of Membership Fees shall constitute the basic funding of the Association. Organizzazione: Article 9 – The bodies of the Association shall be: - The General Assembly - The Executive Committee - The Association shall appoint auditors (two) to assist the General Assembly. EAEVE: cosa richiede? La visita EAEVE: - il SER 1 - i punti critici (…per Bologna!) 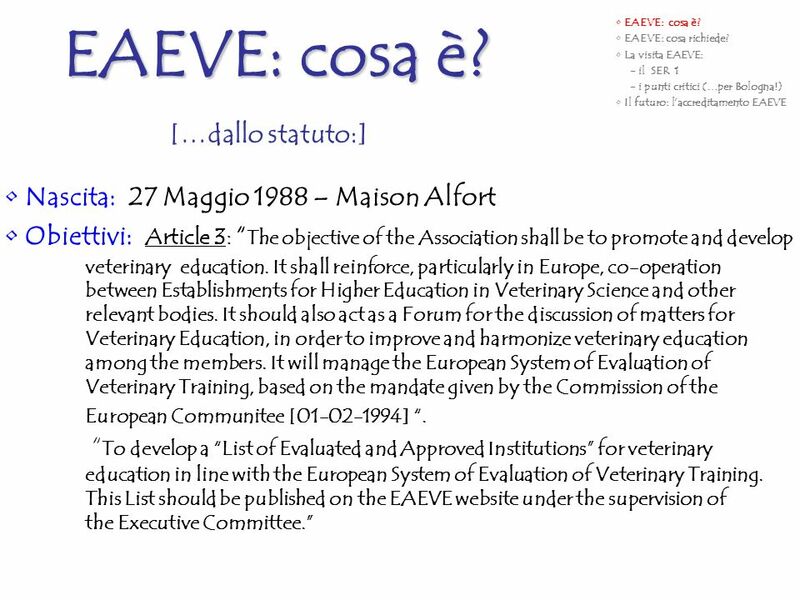 Il futuro: l’accreditamento EAEVE […dallo statuto:] Organizzazione: Article 11 – The General Assembly shall be composed of the Deans or the equivalent official or their nominated Representatives, of the Member Establishments. They may be accompanied by one of their colleagues whose presence they deem useful given the agenda in question. Organizzazione: Article 13 – The Association shall be managed by the Executive Committee. The Executive Committee is composed of the President and the representatives the geographical group areas. Each member of the Executive Committee must come from a different geographical area. Group 1: UK and Ireland and The Netherlands Group 2: Spain and Portugal Group 3: Italy, Greece and Albania, Israel and Romania Group 4: France and Belgium Group 5: Germany, Austria and Switzerland Group 6: Denmark, Norway, Sweden, Finland, Estonia, Latvia and Lithunania Group 7: Slovak republic, Czech republic, Hungary, Slovenia, Poland and Croatia Group 8: Bosnia-Herzegovina, Yugoslavia, FYROM, Bulgaria, Ukraine, Turkey and Russia. 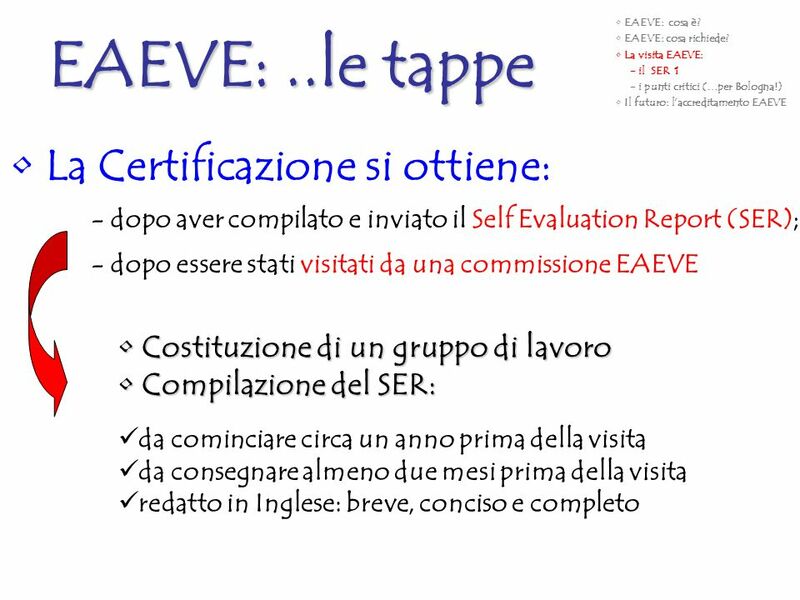 EAEVE: cosa è? EAEVE: cosa richiede? La visita EAEVE: - il SER 1 - i punti critici (…per Bologna!) 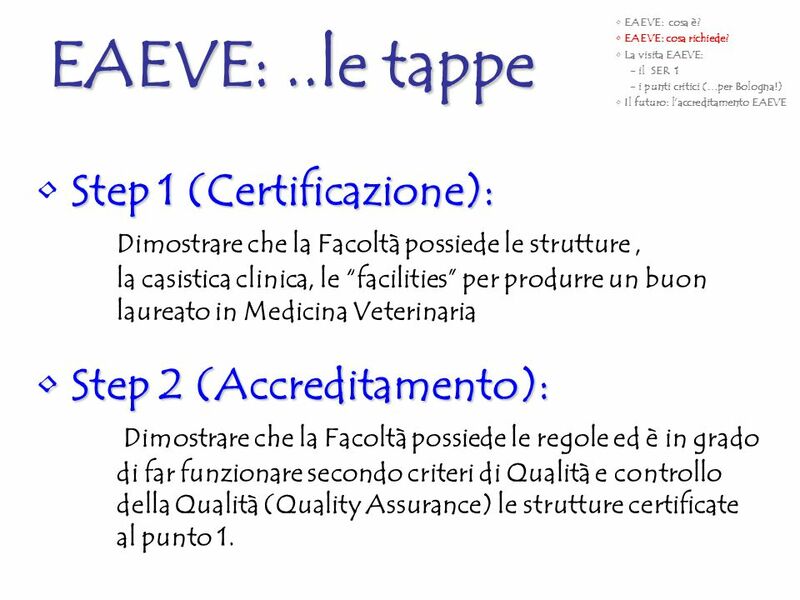 Il futuro: l’accreditamento EAEVE EAEVE: ..le tappe Step 1 (Certificazione): Dimostrare che la Facoltà possiede le strutture , la casistica clinica, le “facilities” per produrre un buon laureato in Medicina Veterinaria Step 2 (Accreditamento): Dimostrare che la Facoltà possiede le regole ed è in grado di far funzionare secondo criteri di Qualità e controllo della Qualità (Quality Assurance) le strutture certificate al punto 1. 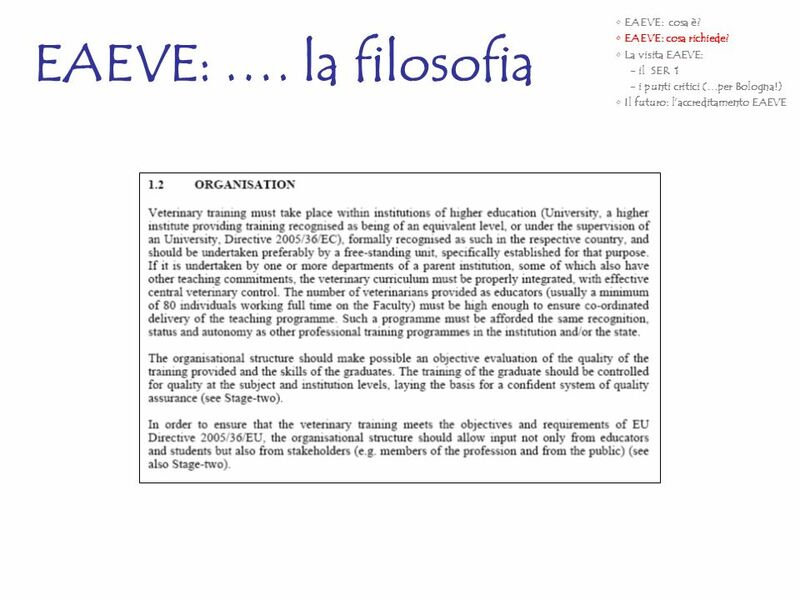 9 EAEVE: ….la filosofia EAEVE: cosa è? EAEVE: cosa richiede? 10 EAEVE: …. la filosofia EAEVE: cosa è? 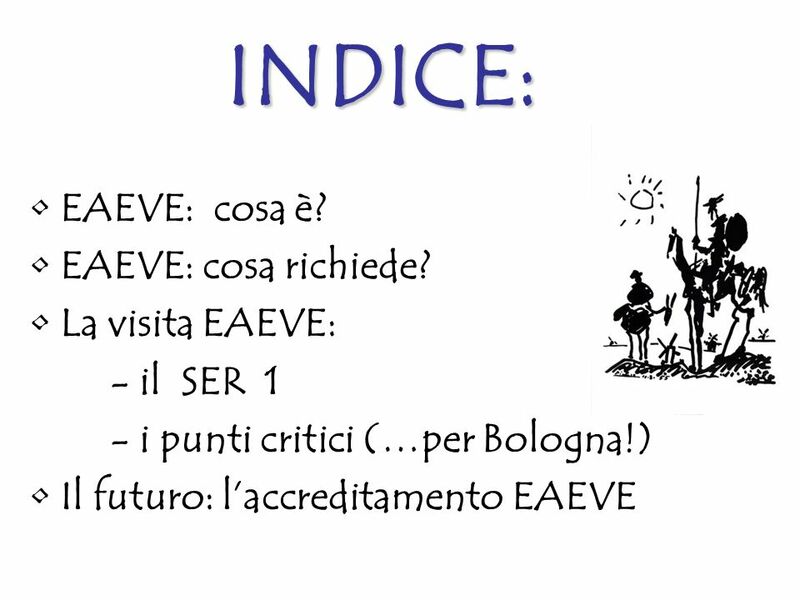 EAEVE: cosa richiede? 11 EAEVE: …. la filosofia EAEVE: cosa è? 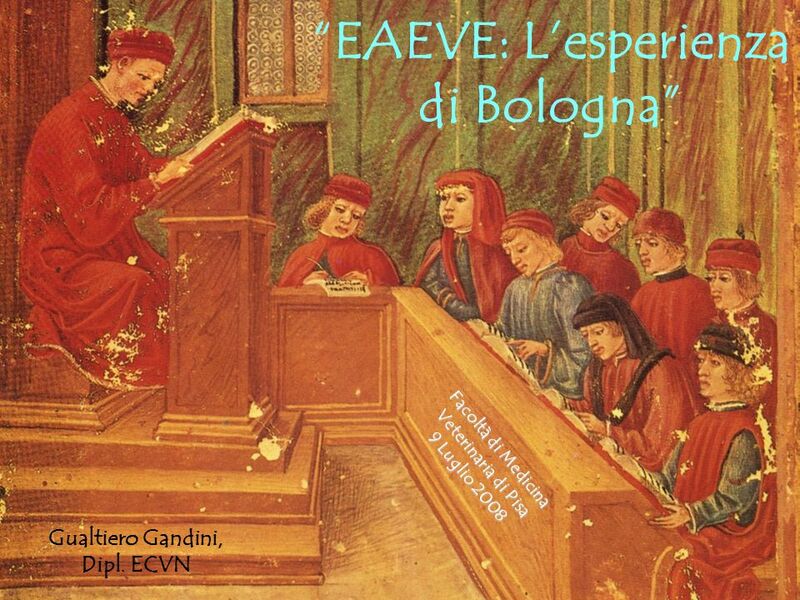 EAEVE: cosa richiede? 12 EAEVE: …. la filosofia EAEVE: cosa è? EAEVE: cosa richiede? 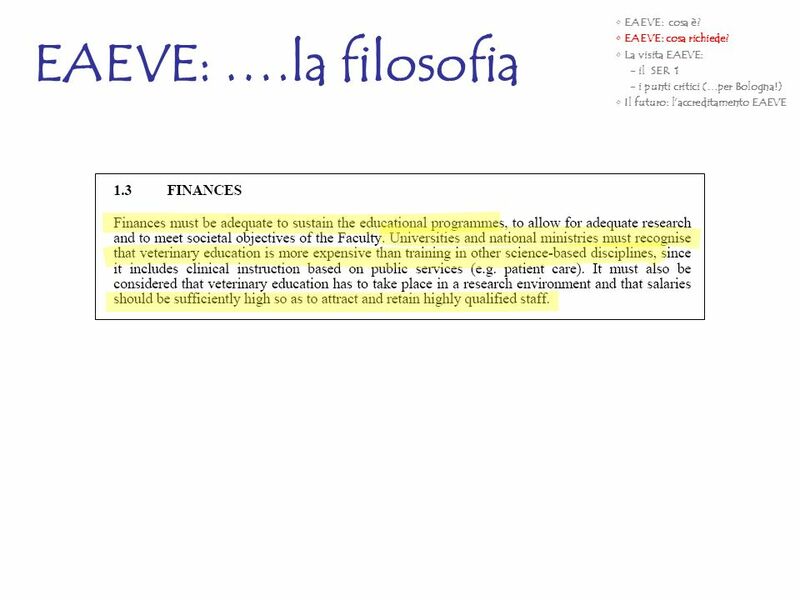 13 EAEVE: ….la filosofia EAEVE: cosa è? EAEVE: cosa richiede? 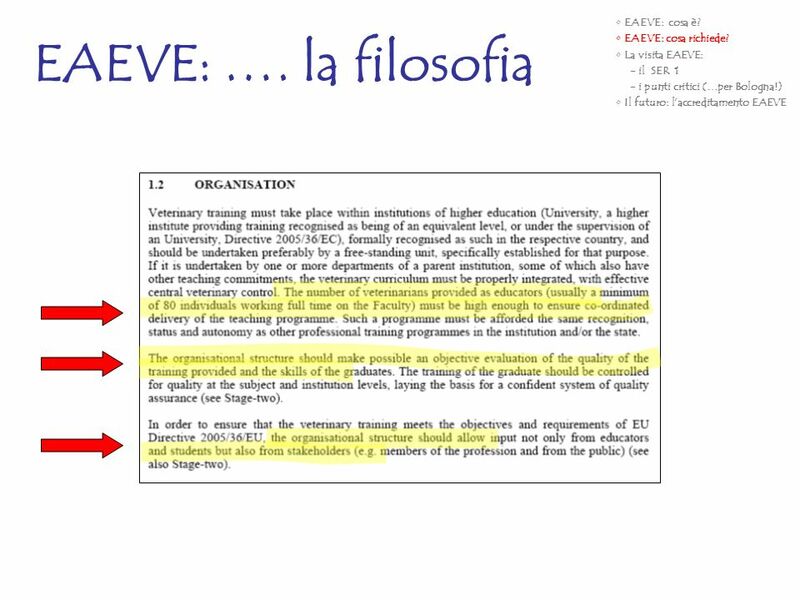 14 EAEVE: ….la filosofia EAEVE: cosa è? EAEVE: cosa richiede? EAEVE: cosa è? EAEVE: cosa richiede? La visita EAEVE: - il SER 1 - i punti critici (…per Bologna!) 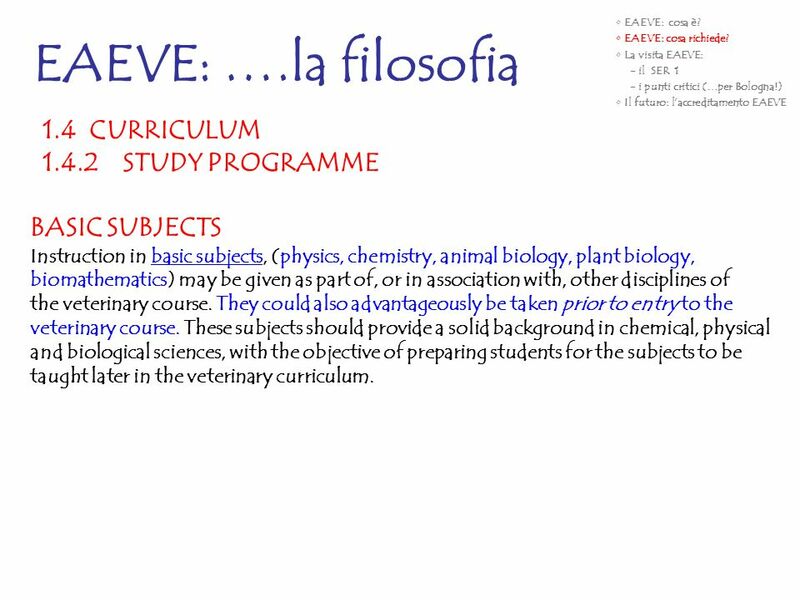 Il futuro: l’accreditamento EAEVE EAEVE: ….la filosofia 1.4	CURRICULUM 1.4.1	GENERAL Veterinary training must comprise at least five years’ full-time theoretical and practical study in a University or equivalent higher education establishment. 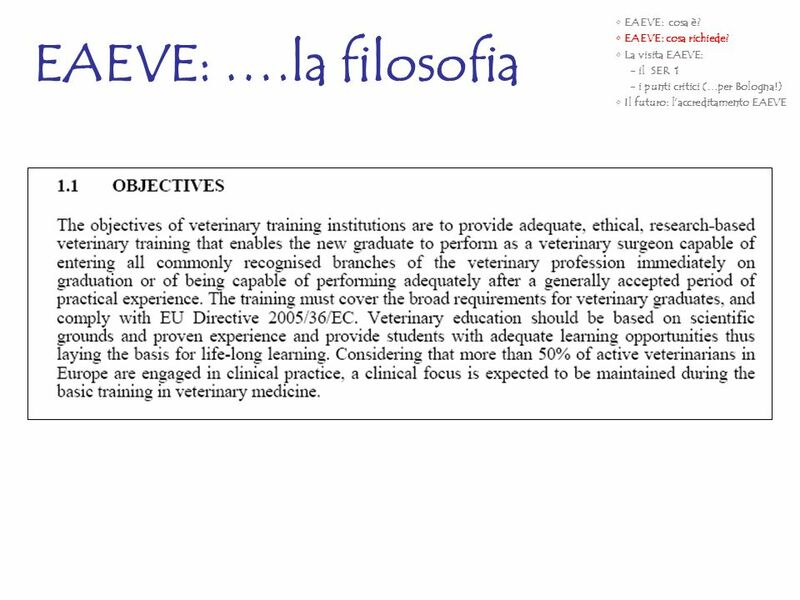 Longer veterinary basic training is a legal decision for the country. 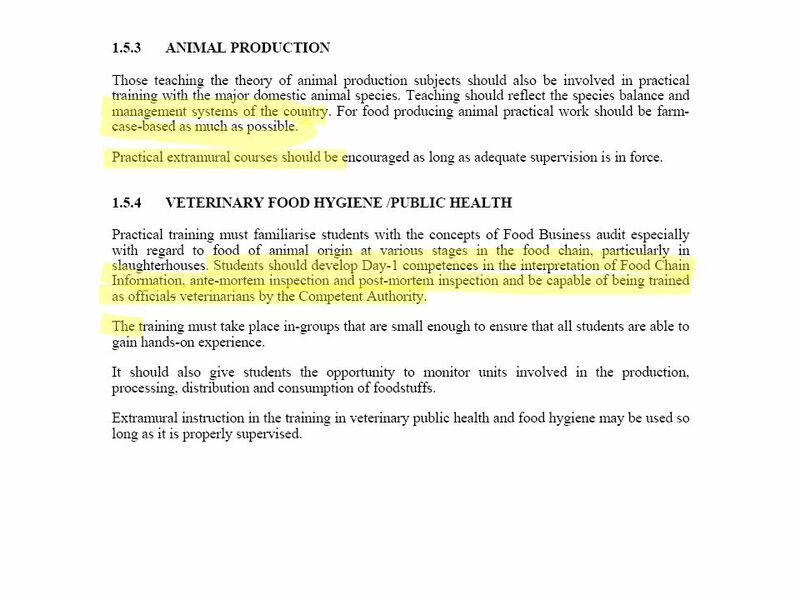 It is imperative to acquire basic knowledge in all fields of veterinary science, particularly in clinical instruction, thus enabling veterinary surgeons to perform all their duties, as stated in Directive 2005/36/EC, Annex V. It is desirable that the students are allowed more advanced training (tracking) in one given field. This can be up to 20% if students meet the day1-competences. Acquisition of generic competences such as skills in written and oral communication, problem-solving and professional attitudes at all stages of the curriculum are an important adjunct to practical and clinical skills. EAEVE: cosa è? EAEVE: cosa richiede? La visita EAEVE: - il SER 1 - i punti critici (…per Bologna!) 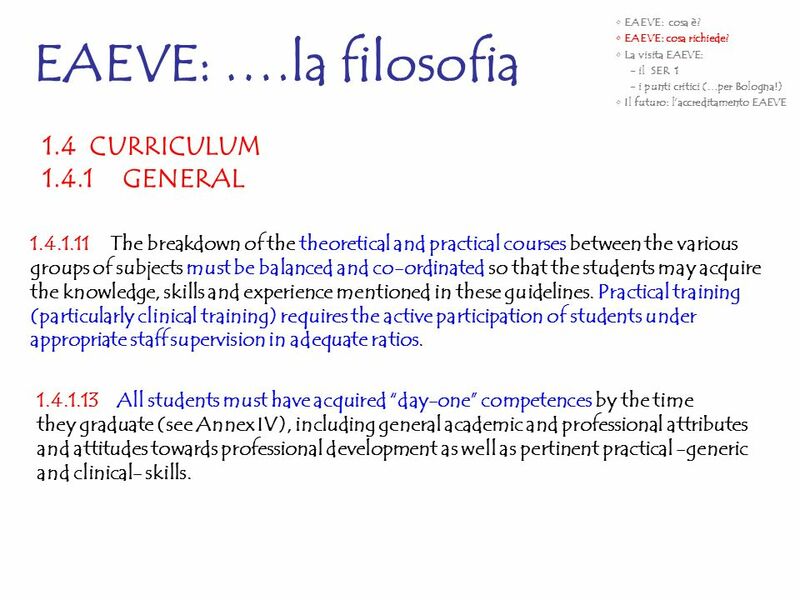 Il futuro: l’accreditamento EAEVE EAEVE: ….la filosofia 1.4	CURRICULUM 1.4.1	GENERAL The breakdown of the theoretical and practical courses between the various groups of subjects must be balanced and co-ordinated so that the students may acquire the knowledge, skills and experience mentioned in these guidelines. Practical training (particularly clinical training) requires the active participation of students under appropriate staff supervision in adequate ratios. All students must have acquired “day-one” competences by the time they graduate (see Annex IV), including general academic and professional attributes and attitudes towards professional development as well as pertinent practical -generic and clinical- skills. EAEVE: cosa è? 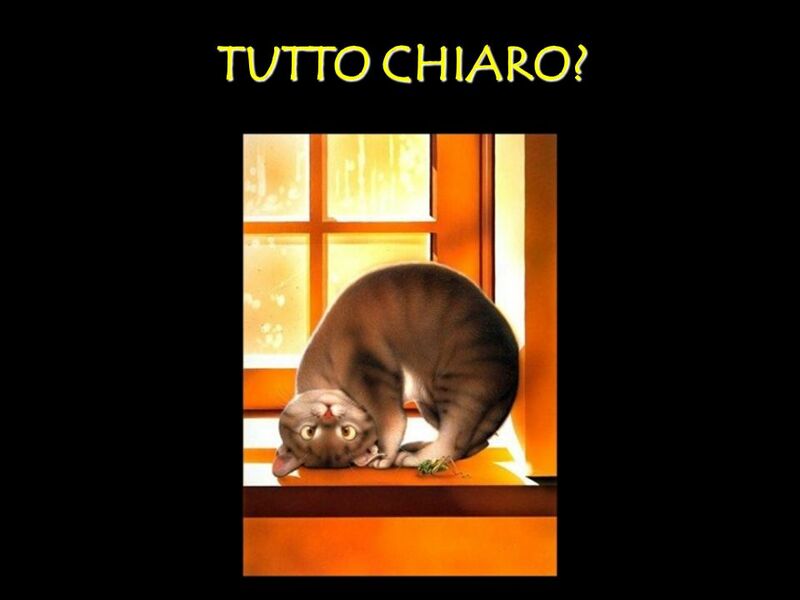 EAEVE: cosa richiede? La visita EAEVE: - il SER 1 - i punti critici (…per Bologna!) Il futuro: l’accreditamento EAEVE EAEVE: ….la filosofia 1.4	CURRICULUM 1.4.2	STUDY PROGRAMME BASIC SUBJECTS Instruction in basic subjects, (physics, chemistry, animal biology, plant biology, biomathematics) may be given as part of, or in association with, other disciplines of the veterinary course. They could also advantageously be taken prior to entry to the veterinary course. These subjects should provide a solid background in chemical, physical and biological sciences, with the objective of preparing students for the subjects to be taught later in the veterinary curriculum. 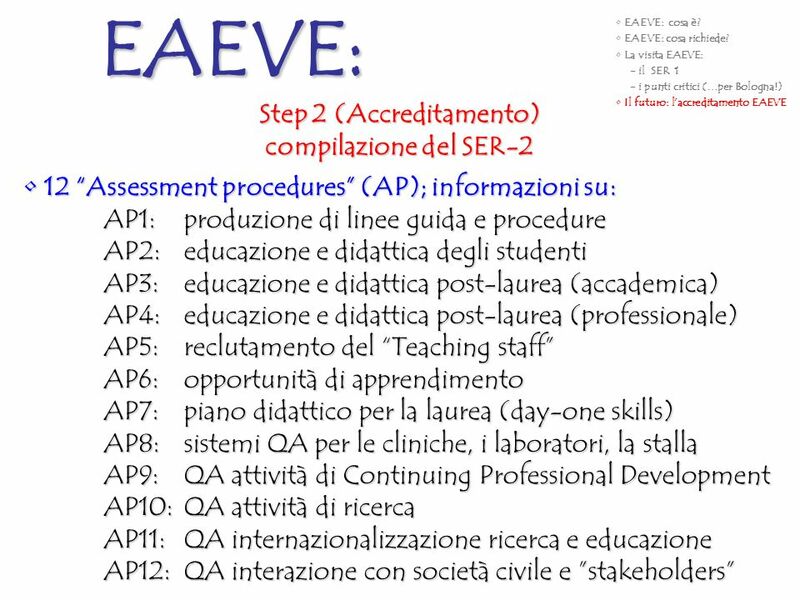 EAEVE: cosa è? EAEVE: cosa richiede? 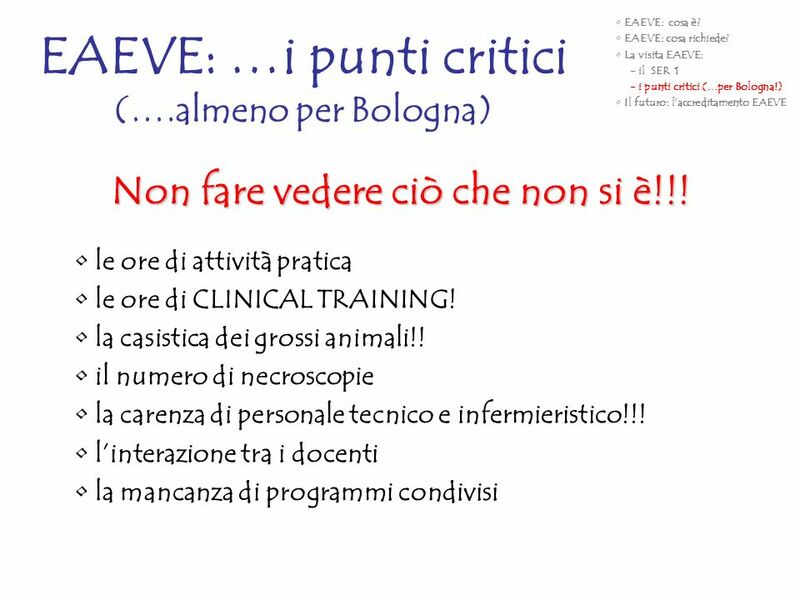 La visita EAEVE: - il SER 1 - i punti critici (…per Bologna!) 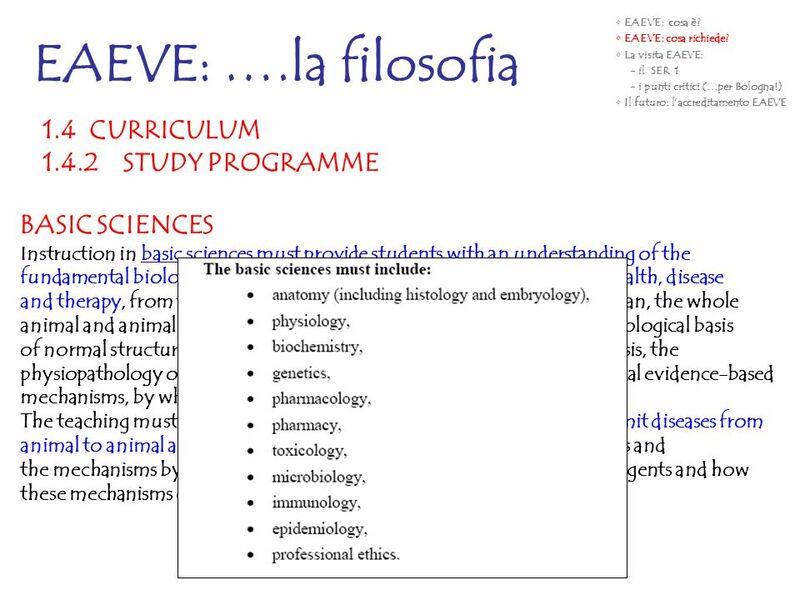 Il futuro: l’accreditamento EAEVE EAEVE: ….la filosofia 1.4	CURRICULUM 1.4.2	STUDY PROGRAMME BASIC SCIENCES Instruction in basic sciences must provide students with an understanding of the fundamental biological principles and mechanisms underlying animal health, disease and therapy, from the molecular and cellular level to the level of the organ, the whole animal and animal populations. 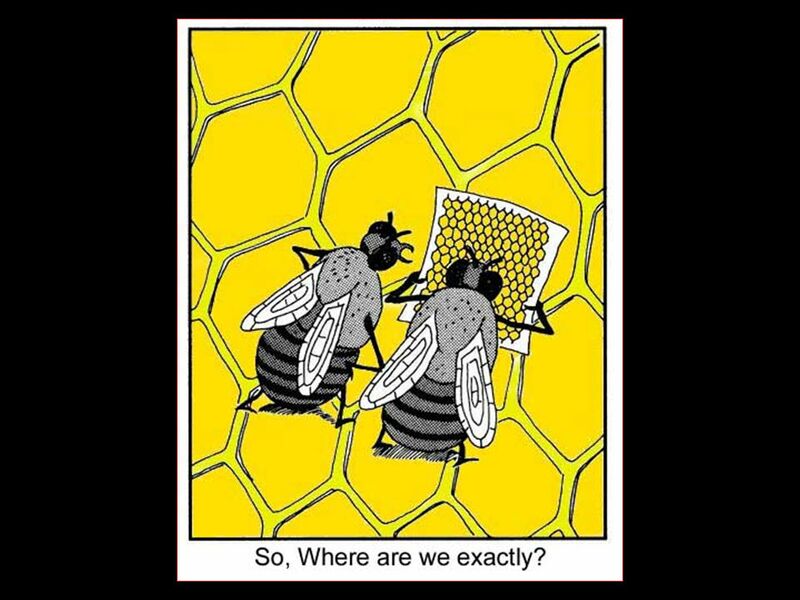 This includes an understanding of the biological basis of normal structure and function, the mechanisms governing homeostasis, the physiopathology of organ systems and the biological and pharmacological evidence-based mechanisms, by which disordered states may be returned to normal. The teaching must also cover the biology of agents that cause and transmit diseases from animal to animal and from animal to man, the transmission mechanisms and the mechanisms by which animals defend themselves against infectious agents and how these mechanisms can be induced. 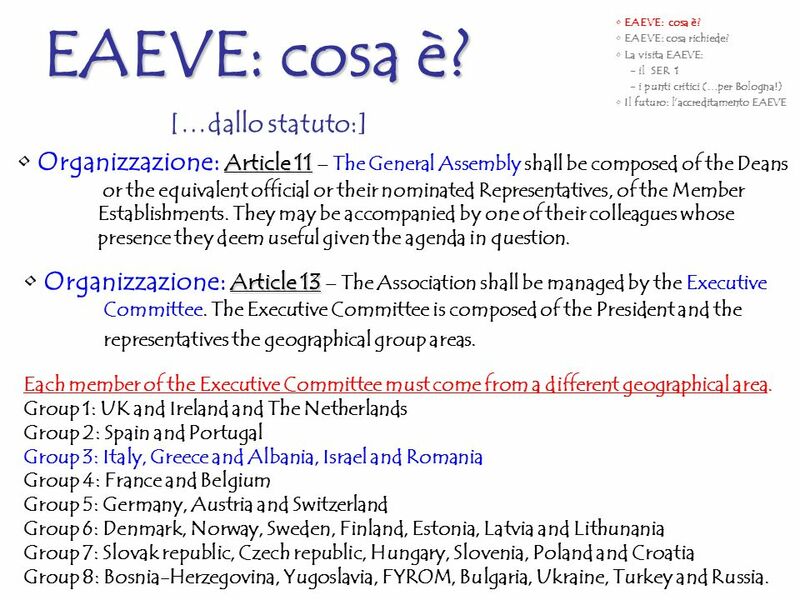 EAEVE: cosa è? 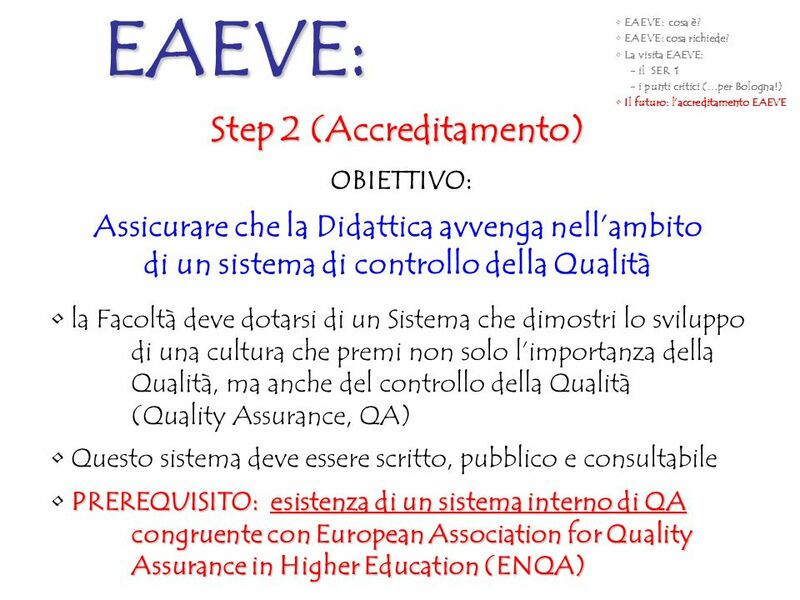 EAEVE: cosa richiede? La visita EAEVE: - il SER 1 - i punti critici (…per Bologna!) 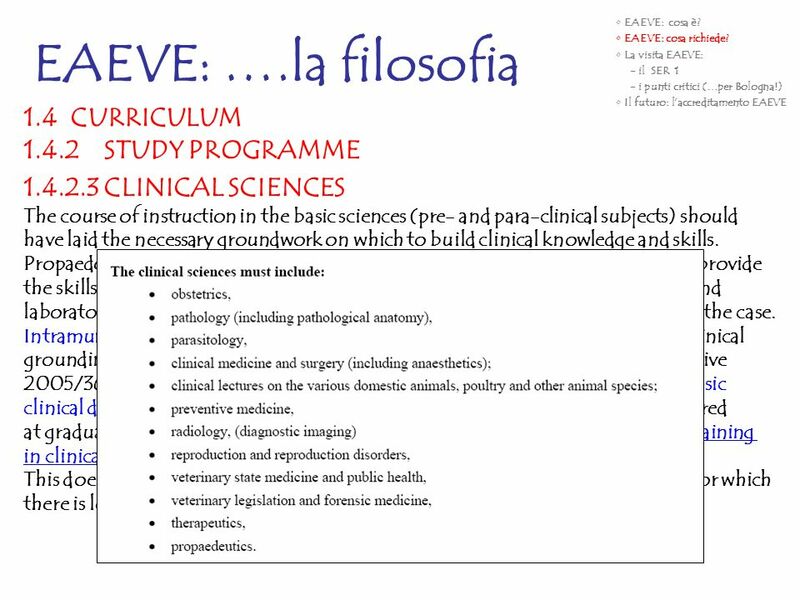 Il futuro: l’accreditamento EAEVE EAEVE: ….la filosofia 1.4	CURRICULUM 1.4.2	STUDY PROGRAMME CLINICAL SCIENCES The course of instruction in the basic sciences (pre- and para-clinical subjects) should have laid the necessary groundwork on which to build clinical knowledge and skills. Propaedeutic training, as listed in the Annex V.4 of Directive2005/36/EC, must provide the skills required to examine the patient or analyse the case, collect the clinical and laboratory data as the fundamental basis for a diagnostic and therapeutic plan for the case. 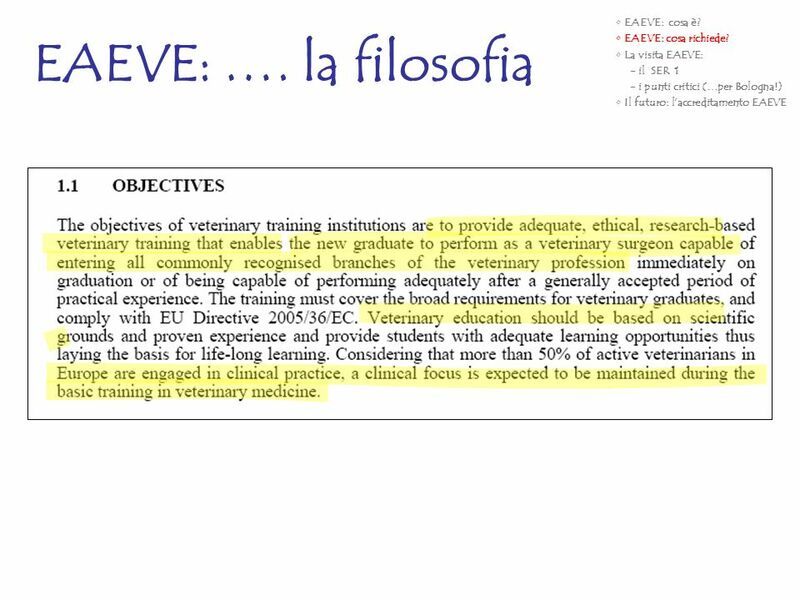 Intramural clinical training must be provided so all students receive a common clinical grounding, encompassing all species and disciplines, in accordance with the Directive 2005/36/EC, Annex V, and adequately enable veterinary surgeons to perform basic clinical duties in all species, if required (see the list of essential competences required at graduation, the so-called “day-one skills” in Annex IV. 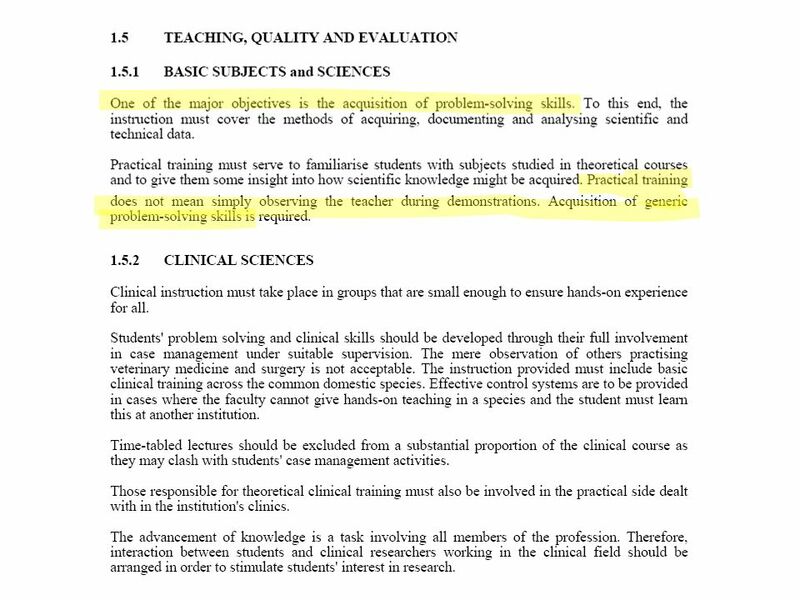 The time allotted for training in clinical sciences should account for at least 40% of the entire curriculum. This does not preclude the acquisition of additional knowledge in selected areas for which there is less demand as considered in the Directive 2005/36/EC. EAEVE: cosa è? EAEVE: cosa richiede? La visita EAEVE: - il SER 1 - i punti critici (…per Bologna!) 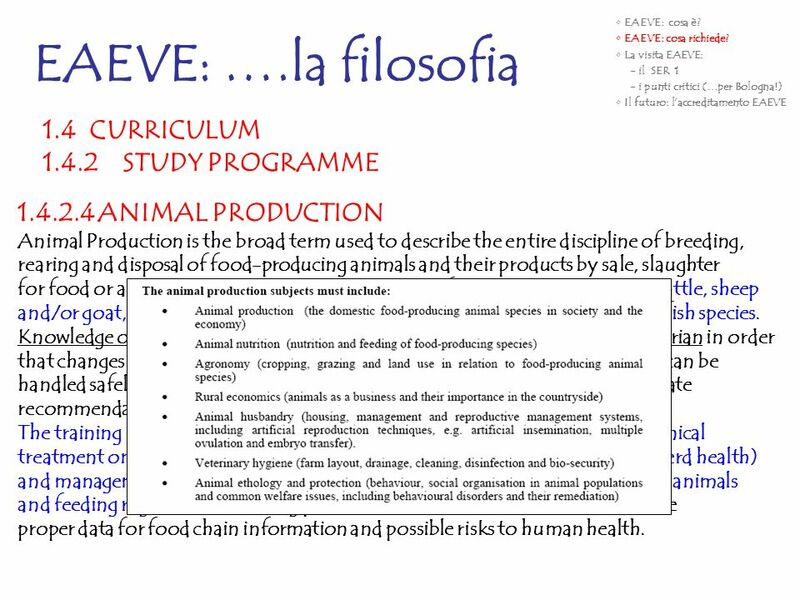 Il futuro: l’accreditamento EAEVE EAEVE: ….la filosofia 1.4	CURRICULUM 1.4.2	STUDY PROGRAMME ANIMAL PRODUCTION Animal Production is the broad term used to describe the entire discipline of breeding, rearing and disposal of food-producing animals and their products by sale, slaughter for food or as waste. Tuition must cover the major food-producing species (cattle, sheep and/or goat, pigs, poultry, rabbits, and equine) and one example of a farmed fish species. 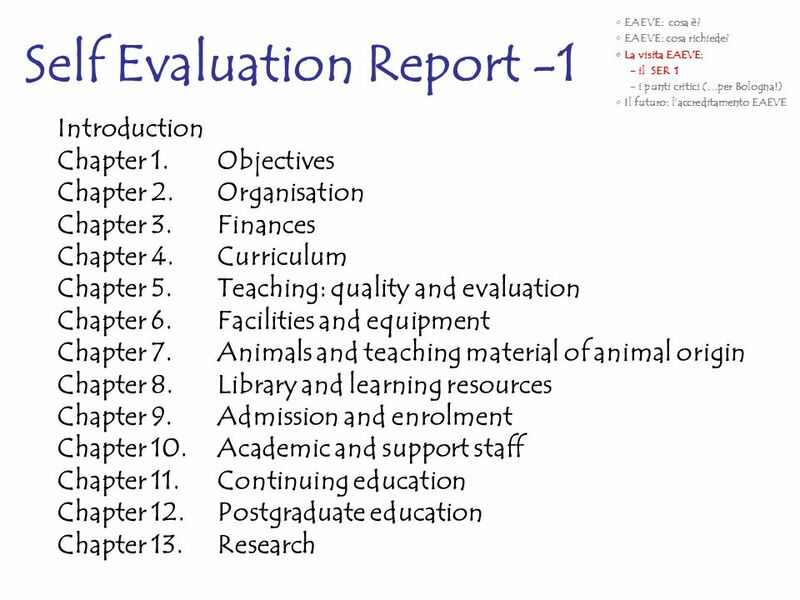 Knowledge of animal production in its broad sense is essential for the veterinarian in order that changes in normal behaviour and management can be detected, animals can be handled safely, treatment can be given in an appropriate manner and appropriate recommendations can be made for prophylactics and care. 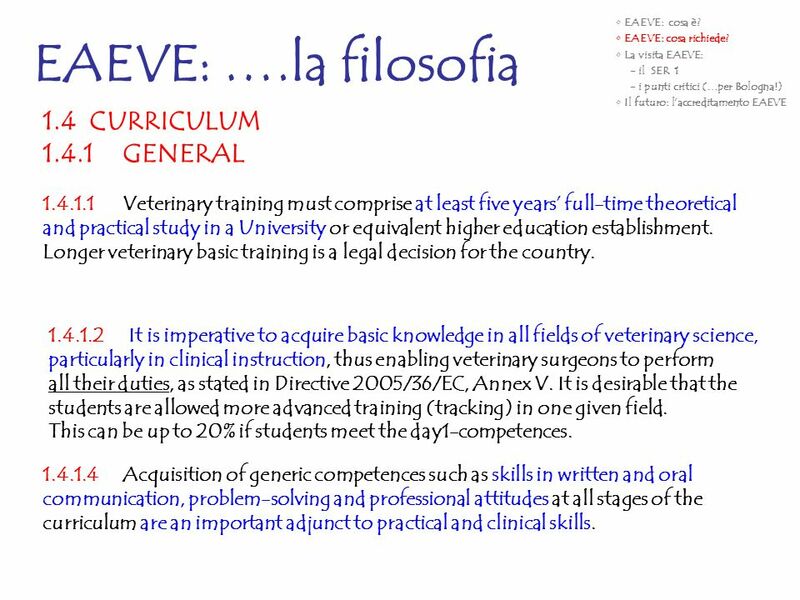 The training must be oriented towards the application of prophylactics and clinical treatment on individual and herd basis, preventive veterinary medicine (e.g. herd health) and management of epidemic diseases, reproductive management, housing of animals and feeding regimes. The training provided should allow veterinarians to derive proper data for food chain information and possible risks to human health. EAEVE: cosa è? EAEVE: cosa richiede? La visita EAEVE: - il SER 1 - i punti critici (…per Bologna!) 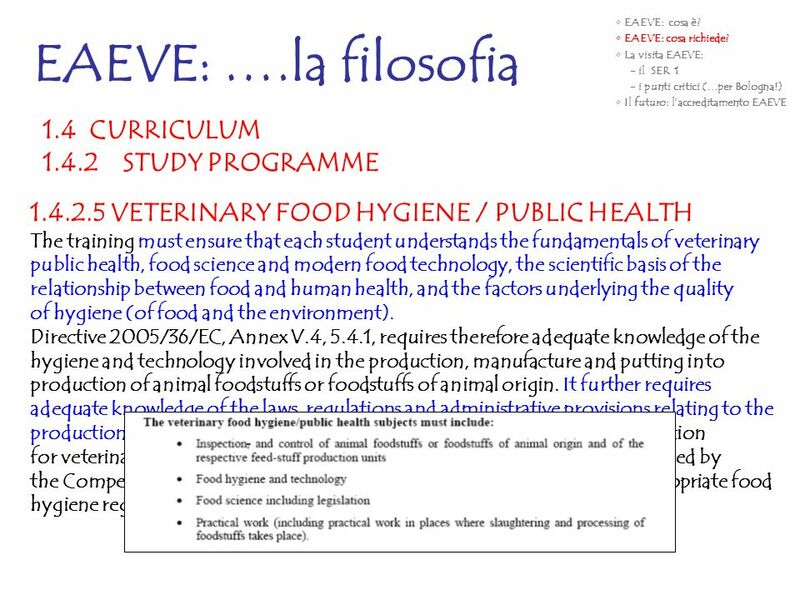 Il futuro: l’accreditamento EAEVE EAEVE: ….la filosofia 1.4	CURRICULUM 1.4.2	STUDY PROGRAMME VETERINARY FOOD HYGIENE / PUBLIC HEALTH The training must ensure that each student understands the fundamentals of veterinary public health, food science and modern food technology, the scientific basis of the relationship between food and human health, and the factors underlying the quality of hygiene (of food and the environment). Directive 2005/36/EC, Annex V.4, 5.4.1, requires therefore adequate knowledge of the hygiene and technology involved in the production, manufacture and putting into production of animal foodstuffs or foodstuffs of animal origin. It further requires adequate knowledge of the laws, regulations and administrative provisions relating to the production of such foodstuffs. Veterinary public health/Food hygiene education for veterinarians must therefore ensure that, on graduation, they can be trained by the Competent Authority (CA) to carry out the audits described in the appropriate food hygiene regulations. 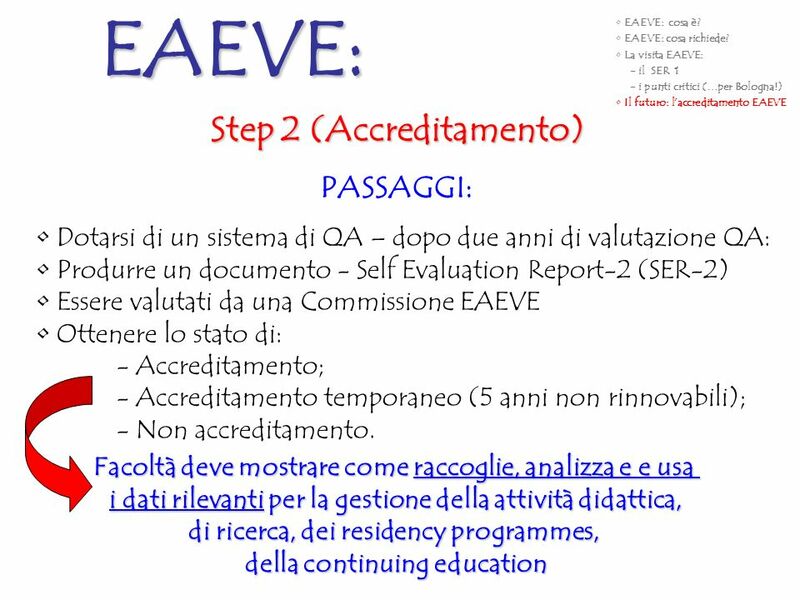 EAEVE: cosa è? EAEVE: cosa richiede? La visita EAEVE: - il SER 1 - i punti critici (…per Bologna!) 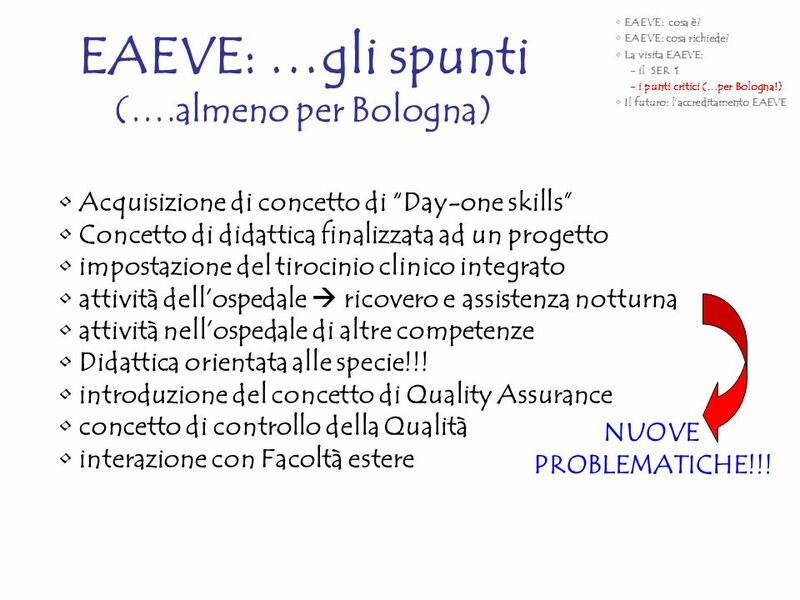 Il futuro: l’accreditamento EAEVE EAEVE: …gli spunti (….almeno per Bologna) Acquisizione di concetto di “Day-one skills” Concetto di didattica finalizzata ad un progetto impostazione del tirocinio clinico integrato attività dell’ospedale  ricovero e assistenza notturna attività nell’ospedale di altre competenze Didattica orientata alle specie!!! introduzione del concetto di Quality Assurance concetto di controllo della Qualità interazione con Facoltà estere NUOVE PROBLEMATICHE!!! 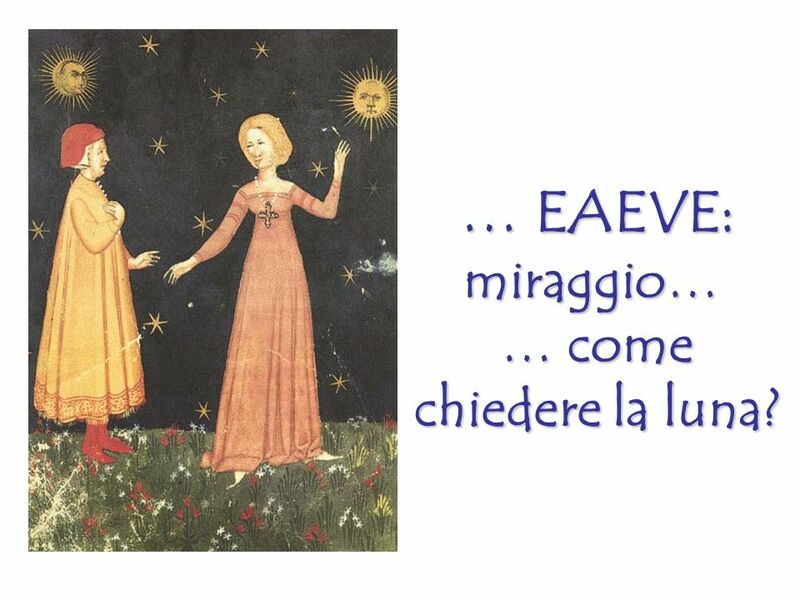 32 … EAEVE: miraggio… … come chiedere la luna? 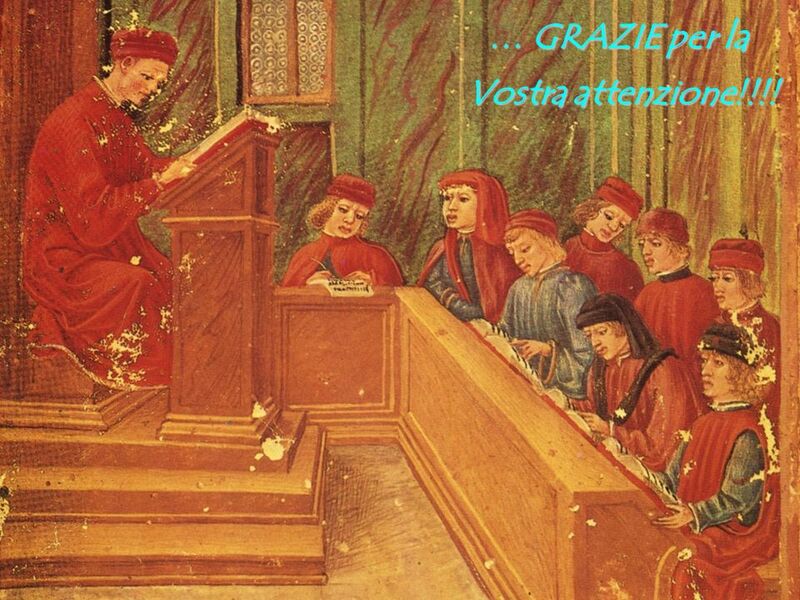 33 … GRAZIE per la Vostra attenzione!!!! Scaricare ppt "“EAEVE: L’esperienza di Bologna”"
AMSTERDAM 9 – 12 december 2004 Health promotion in an Intercultural Hospital: some tools Direzione Distretti EST OVEST Responsabile Progetto Speciale Immigrati. Brussels launch of the Association Bruno Trentin-ISF-IRES Fulvio Fammoni President Associazione Bruno Trentin-Isf-Ires (Italy) Brussels, 26 settembre 2013. IRCCS Fondazione Salvatore Maugeri Clinica del Lavoro e della Riabilitazione, Pavia (founder) Università degli Studi, Pavia (founder) IRCCS Fondazione. CRUI La ricerca per la qualità della vita: la priorità "salute" del 7° Programma Quadro Ferrara, 25 ottobre 2006, Aula Magna - Palazzo Bevilacqua Costabili. A. Oppio, S. Mattia, A. Pandolfi, M. Ghellere ERES Conference 2010 Università Commerciale Luigi Bocconi Milan, june 2010 A Multidimensional and Participatory. European Labour Force Survey. Work status of persons aged 15 years or more in the EU-25, 2003. Chistmas is the most loved holiday of the years. Adults and children look forward to Chistmas and its magical atmosphere. It is traditional to decorate.